Damaged beyond repair in an accident prior to take-off at Idris, Libya on 22/4/56 when undercarriage was retracted on the ground. Broken up on site. 13-seater Transport Aircraft for British South American Airways. C of A number 7281 issued 5/12/45. C of A number 7252 applied for but never issued. Returned to RAF (20 MU at Aston Down) on 17/05/46 after loan. C of A number 7253 applied for but never issued. Fitted with Lancastrian style nose cone by Avro at Waddington. Dismantled at Langley in December 1949 and sold to R J Coley & Sons for scrap. Sent to Airtech Ltd. of Haddenham nr Thame in March 1947 for the fitment of the under-belly pannier. 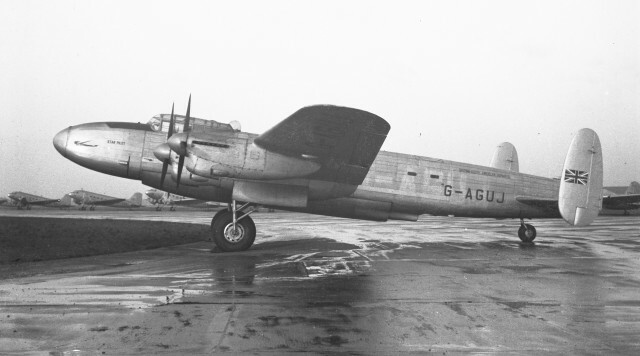 Dismantled at Dunsfold in December 1949 and sold to R J Coley & Sons for scrap. Mill Farm, Hanworth Rd., Hounslow; Coley’s Scrapyard, Hanworth, Middlesex.